Gleaming Tassel Earrings Right on Trend for a Stylish Fashionista! 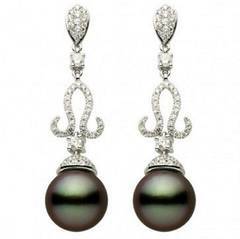 Gold on Sterling Silver- Good White Baroque Pearl 14 mm from the Orient, Side Stones-Round Ruby, with Lustrous Onyx Tassel Beads, wire hook earring closure. measures: 3 1/2" l. You will love wearing these earrings, they sing with joy! Large Chandelier earrings. Silver topped gold , rose cut diamonds and green and red tourmalines. 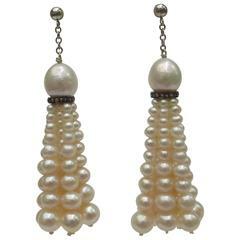 These indian inspired earrings will elegantly sway as you move .